That’s how Scotch whisky got into my Saratoga cocktail. The first time I wrote about the Saratoga, it crossed my mind to try it with other spirits, particularly Scotch. Without much deep thought, I wrote it off as not a “proper” Saratoga, and, more to the point, a really bad-sounding combination that couldn’t possibly work. Fast forward to last weekend, when I was trying to come up with a good cocktail for a straight Scotch drinker. Maybe it’s because I was in a Manhattan kind of mood that the Saratoga came to mind; this time, the idea of making it with Scotch seemed like a natural experiment. And humbled once again by preconceived notions, I’m here to tell you it worked great. 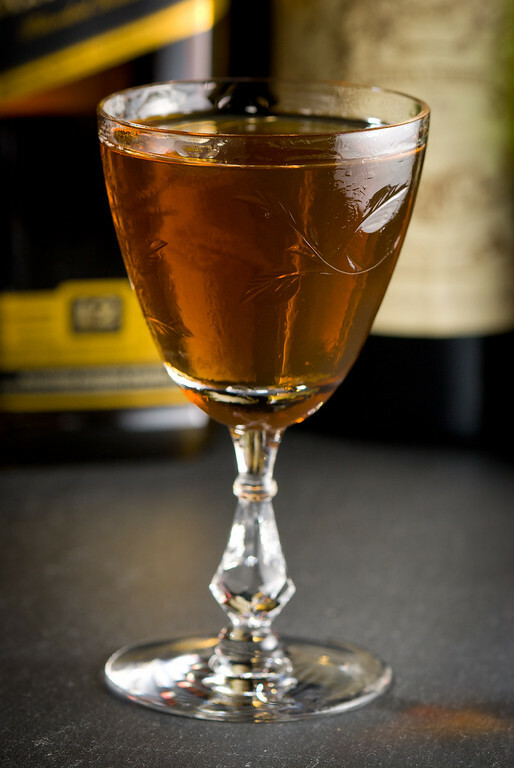 Not as round nor as sweet as the original rye version, this Scotch variant shows off the classic Scotch whisky characteristics—particularly the dry maltiness and slight, peaty smokiness—but it rounds off the sharp edges with the brandy and vermouth to make a delightful aperitif cocktail. Stir all ingredients with ice until very cold; strain into a chilled cocktail glass. Optionally garnish with lemon, or not at all. The Famous Grouse has become my standard blending Scotch, and I haven’t tried this with other brands or styles. I would recommend that you use your favorite, though I suspect that strongly peated whiskies may not work as well as the lighter styles. “The Scotch Saratoga” at cold-glass.com : All text and photos copyright © 2011 Douglas M. Ford. All rights reserved. I just tried this with a 1/4 oz. of Benedictine added, along with an extra dash of Angostura. Delicious, and a close cousin of a Saratoga #2 (a rye Saratoga that includes a bit of Grand Marnier, which I picked up somewhere). I can believe a bit of Benedictine could work well in the mix, I look forward to trying it. Thanks! Sensing a kinship between the smokiness of mezcal and scotch, I tried a mezcal Saratoga. It took a teaspoon of Campari to cut the sweetness a bit, but the result is quite delicious.